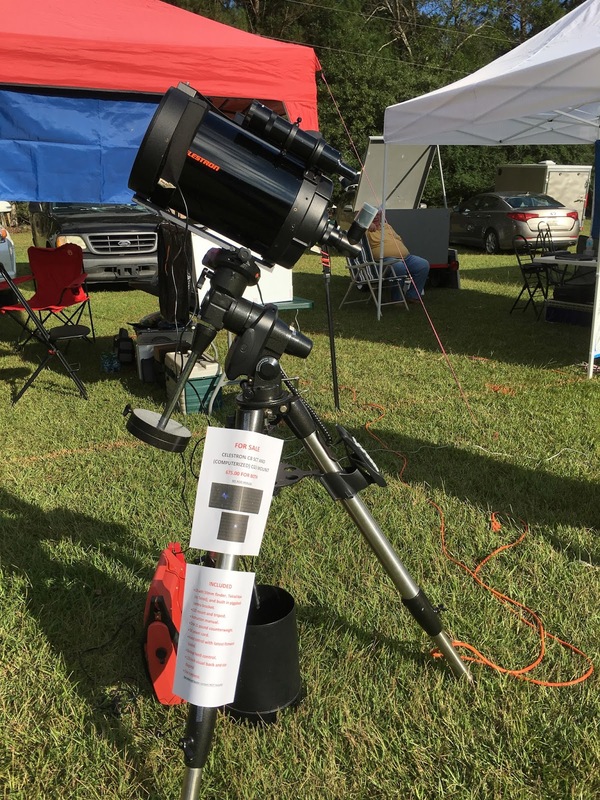 What’s been the bane of U.S. amateur astronomers east of the Mississippi this year? The weather. The stinking weather. The horrible, cloudy weather. I hoped things were changing for the better, though, and the nice skies we had at the Peach State Star Gaze encouraged me to believe they were, finally. Given that the prospect for storms tends to lessen as you get out of October and into early November, I definitely felt good about our chances for pretty weather for the 2015 Deep South Regional Star Gaze. 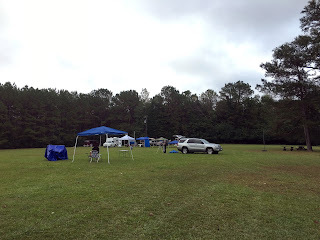 I had hopes, yeah, but let’s cut right to the chase: those hopes were not exactly dashed, but weather conditions didn’t allow the star party to be all it could have been. That was OK; even a slightly compromised star party is way better than staying home. It was evident a couple of days before it was time to head for the wilds of northern Louisiana and the Feliciana Retreat Center, home of the DSRSG, that this was one of those times when a front’s passage being delayed would not be a good thing. Instead of moving through early in the week, it would creep in on Friday, spoiling the prime Friday/Saturday night action, and, I feared, keeping attendance numbers down. Way down. 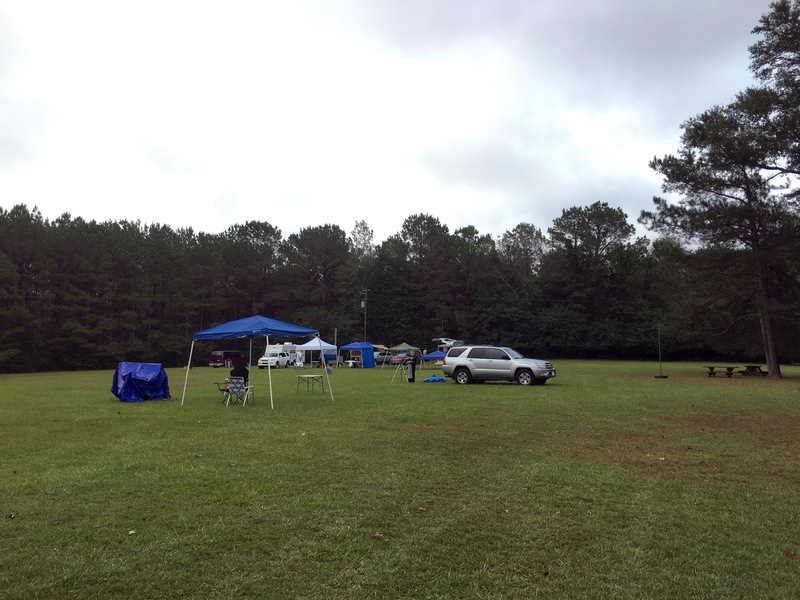 While I can have a wonderful time at a completely clouded out star party, plenty of folks will cancel if the weather looks like it won’t be perfect. And with the bad stuff coming in on Friday, those unfortunates who couldn’t take off from work earlier in the week would have no reason at all for coming if all they wanted to do was observe. Weather forecasts be damned, Tuesday afternoon Dorothy and I loaded up the 4Runner, Miss Lucile Van Pelt, for our departure for DSRSG early on Wednesday morning. One of the greatest things about this star party for us is that it’s only a little over three hours away, and a fairly short drive makes us more willing to face the prospect of a complete skunking. Not that I believed we’d be totally skunked anyway. I had hopes of getting some images, some DSLR images, for a magazine article I was doing, and also trying out what I believe will be, as its name implies, a revolutionary new video astronomy setup, the Revolution Imager, over the course of the two nights that it appeared would be passable. Rolling west on I-10, all was well until we neared the Louisiana state line. At that point our GPS, piped up with, “The Interstate is closed ahead; we will now detour.” There was major road construction on I-10, 17-freaking miles of it, 17-miles of one lane traffic, and the GPS had thankfully heard (from the road conditions radio broadcast) that an accident had brought traffic to a complete and utter standstill for most of those miles. We were only delayed about half an hour by the detour onto state highways, and were soon back zooming along on I-12 and headed for Feliciana. Still, I couldn’t help wondering whether this year’s Deep South was turning out to be cursed. When we pulled onto the storied observing field (we’ve been at the Feliciana Retreat Center location since 2009), the Sun was already past the Meridian and gear set up needed to proceed on apace. What did I set up? First of all, my Megrez II APO refractor, Miss Veronica Lodge, on the Celestron VX mount. It seemed to me that this night would likely be the best of the four, and I intended to concentrate on DSLR imaging with the refractor. That wasn’t the only scope I assembled, however. I also set up my 1987 Super Polaris C8 OTA on my old CG5 mount. I usually only bring one scope to a star party, but I had good reason for lugging out the ancient SCT: I wanted to sell her. I’m at the point where I don’t want gear sitting around unused. Among other reasons because I don’t like the idea of scopes collecting dust in my shop when they could be making a young person on a cash-strapped amateur happy. I’d decided the CG5 mount had to go for the same reason. C8 on the CG5, I taped a “for sale” sign to a tripod leg. Assuming no one stepped up to the plate with some cash right away, I thought I might even use the C8. As above, I came bearing one of Mike Fowler’s (Orange County Telescope) new Revolution video imager kits and I had some hopes of testing it if the weather cooperated. The SCT, I thought, would be more suitable for that task than the refractor. 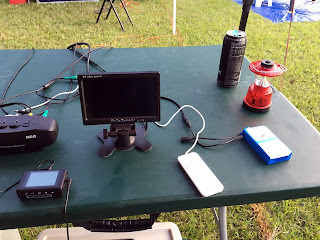 Once Dorothy and I had the ancillary gear—EZ-up tent canopy, observing table, camp chairs, etc., etc.—squared away, I ran my long extension cord to the field’s AC power outlet board and plugged in. Having AC available at a star party is just so nice. No batteries to worry about running down, no need to recharge ‘em the next morning. Field work done, our next mission was getting settled in our little room at the lodge. Certainly, the accommodations at FRC are not palatial; the rooms are about 1/4 the size of your average Days Inn crackerbox palace, but they are nevertheless much better than the chickie cabins or tents that are de rigueur at many star parties. Whatever may be lacking in the small rooms is more than made up for by the Center’s beautiful dining room, which overlooks a small lake. So, unpacked, all that was left to do was wait for darkness and the 3 pm raffle. As usual, I didn’t win a darned thing. That was the bad; the good was that the sky, which had been partly cloudy all afternoon, was beginning to clear off. There was no doubt in my mind whatsoever that we’d have a long night. The next event on our schedule wasn’t observing, however, but supper at 4 pm. The previous year, I’d thought the normally good FRC food had been down a notch or so in quality and quantity. This year it was thankfully back to its normal excellence and abundance. I concentrated mostly on the salad bar, but the chicken we were served was good enough. I do not hesitate to say the DSRSG meals are among the best I have eaten at any star party in the entire U.S. of A. Maybe the best. Wednesday evening was indeed the long night I’d wished for. Almost too long. Imaging these days is much different from what it was when I got started in a big way in the 1980s. Then, you spent your whole night staring into a guiding eyepiece. You had to keep that pesky guide star centered on a crosshair reticle or your picture would wind up with trailed stars. Boring, but at least you were occupied. Today, you align the mount, get the autoguider going, focus up, tell the software (Nebulosity 3 in my case) to take, say, 20 4-minute exposures, and your presence is no longer required for over three hours (including the time for dark frames). What do you do? What did I do on this night? If I’d been smart, I’d have brought my 15x70 Burgess binoculars to the star party and given the sky a good bino survey. Alas, they were the one thing I forgot to pack this time. Instead, I wandered the field cadging looks through the telescopes of the many old friends—I’ve been doing DSRSG for so long that my fellow attendees are really more like family now. Headed back to the lodge a time or two for coffee. Occasionally looked in on Veronica. 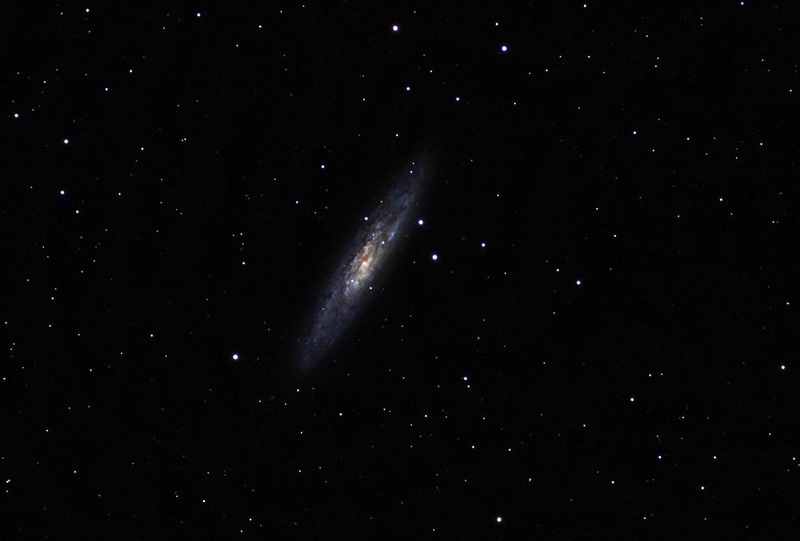 She was doing just fine grabbing sub-frames of the great galaxy NGC 253, and PHD2 was guiding like a champ. I did another couple of loops of the field before it was time for target two, M45. M45 underway, I gotta say I was getting awful bored. I thought I might crank up the C8, even just for visual, but I’d have had to hook up power, find the eyepieces, etc., and I was now feeling a bit weary, as I usually am on the first night of any star party due to travel and set up, so I demurred. Somewhat before the Seven Sisters shot wrapped up, the sky began to go south. The problem wasn’t clouds, or at least not high clouds, but ground fog that began to roll in in waves. I figured that spelled Big Switch time, but I was spared for about another hour. My side of the field was slightly elevated, and the ground fog would creep up, but not quite reach me before temporarily dissipating. Not that there wasn’t some haze, naturally, but I was able to push on for a while with a bright target, M42, which was now well above the trees. Just as my exposure sequence, my first Orion Nebula of the season, finished up, the fog rallied its forces and advanced with a will, finally smothering my scope. That was it, and I won’t say I was sorry to pull that cursed switch. I’d got the images I’d come for, and even without the fog the night had been miserably damp. My DewBuster heater system kept scope and guide scope optics clear, but didn’t keep me dry. The dew was so bad that it was literally raining under my EZ-Up. Nothing will make you tireder than having a wet head and feet, so I was more than happy to desert the field for the cozy lodge. There, I had a glass of Merlot, cruised Cloudy Nights for a few minutes thank's to the Lodge's good wi-fi, and soon drifted off dreaming of the big cosmic wheel that is NGC 253. Thursday morning brought breakfast and a trip down the field to dry everything out. I removed Veronica’s Desert Storm cover and let her sunbathe for a while, and grabbed a towel and tried to dry off the observing table. There was about a quarter inch of water on it. It hadn’t rained, y’all; that’s how bad the dew was. One thing was sure: I was glad I had been able to run the DewBuster off AC; I don’t know if a battery would have lasted the entire night under such extreme conditions. I was worried that Thursday afternoon would drag, since there were no speakers or other organized activities until Friday, but that turned out not to be a problem. 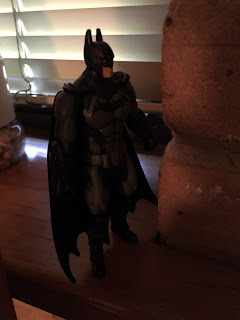 A little reading, a little tinkering with the gear, Internet surfing with my laptop sitting in the dining hall, another raffle (still didn’t win anything), and it was time to think about supper and, after that, observing. It was quite obvious Thursday night was not going to be the night Wednesday had been. The weather-goobers were predicting clouds later in the evening, and at sundown I could see there was plenty of haze. I’d gotten the prime focus DSLR shots I’d planned on getting already, so I thought I might mess around with the Revolution video camera a bit. You are going to get a complete review of the Revolution in a few weeks at the outside, but suffice to say I was impressed. The camera is a known quantity, an LN300, which is very compact and very sensitive and is sold for astronomy by at least two other vendors. It’s a good performer, but what makes the Revolution system special is what you get for its minuscule price. The Revolution kit, which comes in a nice case, includes the camera and a 1.25-inch nosepiece, a 7-inch LCD color monitor, a battery that can run monitor and camera for up to four hours, a battery charger, a .5x focal reducer, an IR filter, a wired remote for the camera (something most LN300s lack and very, very good to have), a wireless remote for the monitor, and all required cables. Everything you need to capture the deep sky except a telescope and mount is right there in the box. Of course none of that means a thing if the camera doesn’t perform. I needn’t have worried. I sent the C8/CG5 to the Dumbbell, M27, put the camera in long-exposure color mode, turned on its stacking feature, and sat back and watched. The first exposure to come in looked good. The next one, which was combined with the first one, made M27 look better, and as the image built up I was soon seeing plenty of detail and impressive color. To be honest, the picture looked similar to what I can see of this object with video with considerably more expensive cameras. The only fly in the proverbial ointment? For your pictures to look their best, to have round stars in stacked exposures, your mount needs to be at least roughly polar aligned, and I had not done that. All I’d done was put Polaris in the hollow bore of the polar shaft. With the sky looking somewhat dicey even at sundown, I hadn’t wanted to waste time doing an AllStar polar alignment with the CG5. Still, the pictures I was seeing on the monitor did not look bad, not bad at all. And the LN300’s sensitivity did not disappoint. It easily picked out the Deer at the Deer Lick, the little NGC galaxies that cluster around big NGC 7331. It made short work of the dim Crescent Nebula, showing detail and color. The Veil Nebula was not a challenge for it. So, with Orion on the rise, I thought I might go even dimmer and see what the camera would do on the Horsehead Nebula. That’s what I thought I’d do, but the weather gods had other ideas, and the first wave of clouds rolled in. It was still relatively early and I was still feeling good—despite almost as much dew as on the previous evening—so I had no problem cooling my heels for a while to see if we might get some clearing or at least some respectable sucker holes. ‘Twas not to be; the sky got worse, not better, and just after midnight I was walking back to the room. I didn't like having such a short run, but it was perhaps a good thing I turned in semi-early, since I'd likely be returning to the field at first light to pack the gear. Thursday afternoon, Dorothy and I had talked about whether we’d stay till Sunday morning as usual or not. The weather prognosticators were forecasting conditions that, while not dire, were not exactly astronomy friendly. The area of nearby Clinton, Louisiana would, they said, get three inches or more of rain between Friday afternoon and Saturday night. 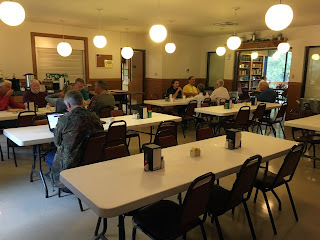 Yeah, I am all for star party fun, and, again, I can have a good time at a clouded out star party, but sitting through rain and thunderstorms with no hope of clearing and not much to do cooped up in our little room or in the dining hall would be another matter. I can watch it rain at home and in comfort. There was also the matter of having to pack wet gear, which is not fun. When I got up Friday, there were clouds aplenty, so I did indeed head to the field to finish packing the remaining equipment—I’d disassembled Veronica and the VX the previous afternoon. Despite my early bedtime the night before, loading the truck just after dawn wasn't exactly a treat, but I was glad I did it. There was the feel of rain in the air, and if I didn't get the stuff in the 4Runner before it began we'd be stuck. Packing done, our intention was to leave shortly after my presentation that afternoon. I’d originally been scheduled to speak on Saturday, but I made the case with DSRSG Managing Director Barry Simon that it would be better for me to go on on Friday. I didn’t believe there would be many people left on Saturday to hear me. Barry was amenable, so I gave my talk, “Exploring Your Final Frontier with Deep Sky Video” Friday afternoon. By the time my presentation wrapped up, it was getting on toward raffle time, and D. and I thought we’d at least stay through that. Did I win anything? Are you kidding? Miss Dorothy did get a nice Mars map, however, so it was a good thing we stayed, and it just felt right to stay through the raffle, anyway. When the prize distribution was done, we hit the road for home. This was only the second time in all our years of DSRSGing that we've left before the bitter end. I was a little sad about that, but as we ran into wave after wave of rain on the Interstate, it was clear we’d made the correct choice. Yeah, we’d only had two nights, but the first night, especially, was a very good night. I captured one of the better—maybe the best—images of the Pleiades I’ve ever gotten. The other shots I took Wednesday were similarly good. I’d also had fun playing with the Revolution. And spending a few days talking amateur astronomy and hanging with my DSRSG homies was also fun—perhaps the most fun of all. So much fun that I can hardly wait for my next journey to the FRC for the Deep South Spring Scrimmage, which is sure to be under clear skies. Nota Bene: You can see more pictures of the star party on my Facebook page, and more of the astrophotos I shot on the fantastic website astrobin.com.